Marrickville is home to some of the city’s coolest underground scenes. Only newly on the radar for most Sydneysiders, the former industrial-dense suburb offers a wealth of recently opened cafes, coffee shops, bars and restaurants, boasting an air of on-trend effortlessness. Far enough from the city that visitors can relish in reduced accommodation prices, but close enough to everything to make it a great base, here are the top places to stay in Marrickville. This is the ultimate place to stay when travelling en masse. This whopping 16-bed palace in Marrickville means serious business. With tasteful, arty decor and tonnes of natural light flooding through the premises, the property hosts a bunch of single beds as well as a couple of doubles and sofa beds. Perfect for a city excursion with the whole family or groups of friends alike, the entire property is furnished and fitted with all the necessary bits and bobs to keep the horde happy. Set in the heart of Marrickville on Addison Road is the aptly named Addisons Travellers Lodge. Ideal for students and short- or long-term travellers, this budget hostel has recently seen an overhaul and offers its guests some great amenities such as a sun-drenched rooftop with BBQ facilities. There is air conditioning throughout and free laundry facilities too, not to mention that it’s all-inclusive, so bills will never be an issue! This artist’s warehouse room just may be one of the coolest places to stay in Marrickville. It’s not only quirky as hell, but there’s a certain charm that comes with the knowledge that the tenants purpose-built ‘The Yellow Room’ to host travellers. Whether its an evening for lounging in the library area or exploring the wall art that thrives in abundance, this stay in Marrickville will be anything but boring. Guests can escape to their own real-life fairytale in the suburb of Marrickville at the quirky and creative Vintage Garden Cottage. Retro and just plain random in many instances, this private hideaway includes access to a lush and leafy garden and is designed with peace and relaxation in mind. This purpose-built property is meant for those in need of a little time to unwind; there is meditation spaces as well as a shared exotic outdoor shower designed with two in mind. Set on the same grounds as the previously mentioned Vintage Garden Cottage is the School Bus House. Quite literally an old school bus, guests can be transported to another realm of fantastical delights with quirky decor in this funky dwelling. Fitted with a bed, bar and dining space, the bus has been designed with romance in mind, offering couples robes and, again, an outdoor shared exotic shower for two. The third and final place to stay in this Marrickville property, sitting alongside the School Bus House and Vintage Garden Cottage, is The Bohemian Retreat. Unique and full of character, this private space is the perfect escape from the bustle of the city, yet still in reach of all Sydney has to offer. Dosed in bohemian decor, with splashes of quirk and charm, this homestay comes with a fitted kitchenette and access to a shared romantic bathroom and the alluring outdoor shower for two. This Sydney suburb boutique bed and breakfast is utterly charming. Taking the art of accommodation back to basics with a true emphasis on guest comfort and experience is what this place is all about. Each room is tastefully decorated; Tara Guest House seems to find itself in the realm of boho and urban and country house and city retreat all at the same time. Added bonuses include free airport transfers and extremely generous breakfasts each morning. This elegant apartment in Marrickville balances contemporary comforts with an effortless style so in tune with the suburb’s surroundings. Exposed brick walls and sporadic art features make the place really pop; curated images dose the walls and Aztec printed rugs punctuate chic furniture and neutral colour palates. The private dwelling has a balcony for sunset views and a stunning antique gate for entry to the boutique block of only three private apartments. Awarded for sustainability and new residential design at the New South Wales Architecture Awards in 2015, this property is rather impressive. The private en suite room is fresh with views over the garden and includes a reading nook and walk-in wardrobe for added comfort. Built with sustainability at heart, many of the property’s materials are recycled; the space is open, modern and airy with wooden accents and much natural light. This cool and cultured warehouse-style studio in Marrickville is the perfect home away from home when in Sydney. With stunning wooden furniture and a fantastic selection of art which peppers the walls, guests will feel at home whilst staying in this unique property. From entering the property via a rustic gate to kicking back in the worldly living room, this property has been refurbished to the highest of standards – and all just moments from the city centre. 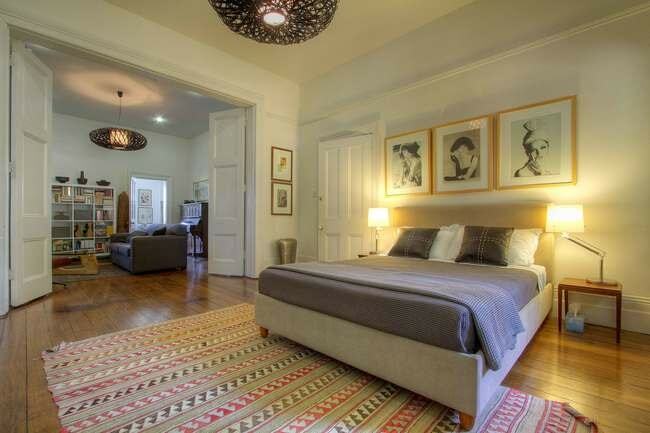 Styled with New York at heart, this fun and fresh private property can sleep up to four guests across two bedrooms. With a neutral palate at its core, this apartment’s style has been built on with pop features, funky colours and fresh artwork. If that’s not enough, there is access to a gym and swimming pool as well as al fresco dining from the sun-drenched balcony.